The Rossini Opera Festival has been a full partner in the latest Rossini revival which started in the latter part of the 20th century. The revival coincided with the drive to establish critical editions for all of Rossini’s operas as well illuminate performance practices and traditions. In addition, the Festival has hosted, fostered and supported incredible singers who have not only made their mark singing Rossini but shown the world how it is done. So, with the “critical editions’ of most of the operas having been published and performed, and a generation of singers launched to perform them, what remains to be done? Is the Festival still relevant after 30 years? The Accademia Rossiniana is a perfect example of how this is done. Every summer a new “crop” of singers is nourished by masters. These singers are already accomplished, some with professional careers. But Rossini singing demands special attention to details that even experienced bel-canto singers may not have. It is sort of like a “finishing school” and the Rossini Opera Festival is unique in providing this opportunity. The strength of the Accademia is naturally this course, or workshop, but it is tethered to the Festival in two important ways: Graduates have the opportunity to perform before Festival audiences who often are lucky to hear future stars for the first time. Furthermore, the Festival brings artists who might not otherwise be available to the students and they can hear first hand “how it’s done”. It is not just the musical side that is nourished by the Festival. The scenographic side is also involved. The Festival cooperates with various educational institutions in exposing and engaging students in the realization of costumes and scenery for one of the Festival’s productions each summer. But, the Festival is “more than” the Academy. 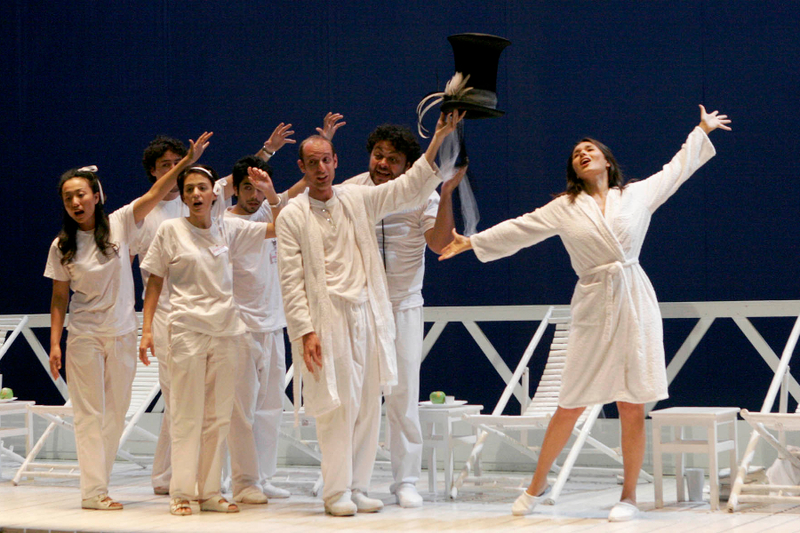 Every summer, in addition to the “graduation performances” of Il Viaggio a Reims, three operas are performed at the Festival in a schedule that allows short-term visitors to hear them all, and longer term visitors to hear them several times. For a lesser known work this is particularly important. Although Rossini is performed all over the world, most often the performances are restricted to a small number of his 39 works for the stage. This is too bad because many of the lesser-known gems would be ideal for smaller opera companies to mount thus introducing a little variety in their “safe” repertory. Festival goers who hear some of these works may return home and help “spread the word” about these operas. It goes without saying that the influx of international visitors to the Festival is a boost to the local economy, but the importance of the Festival is international. What would happen if all of this were to stop? What would be the consequences? The critical editions would lie on the shelf, or sit in a display case, much as ancient Egyptian artifacts might lie sit in museums without curators. Without “musical” curators, these discoveries would have to be rediscovered by future generation. Should there be additional discoveries who would take care of them? Without curators, there is no life and no evolution. The Festival is not static; an “old” production of these works may look quite different from one performed today, and this gives insight into how one can remain “faithful” to the original without becoming stale. Without the Festival, performance traditions or heritage would not be passed on and again would have to be rediscovered by musicians and scholars in the future who would probably send us dark thoughts for having let this happen. Is there anyone who would not have been thrilled to have first-hand knowledge of how the singers who created these roles performance them? Even though we are fortunate to have recordings of all the productions today, the skills must still be passed on. There is a wonderful parallel from the ballet world. The Danish choreographer, August Bournonville (1805 – 1879 ) created many wonderful ballets that modern audiences can see performed “almost” as they were at the time of their creation. This is due to a tradition of teaching the techniques laid down by Bournonville at the time. Generations of teachers and dancers have passed these down, under the “umbrella” of the Royal Danish Ballet. Although these works have fallen in and out of favor over the years, there is an understanding that they are part of the Ballet’s cultural heritage. The lesson to be learned is now that we have these treasures we need to pass them on under the careful guidance of the ROF and its partners. The Rossini Opera Festival will continue to evolve but remains the essential “curator” of the works of Rossini and a heritage that belongs not only to Italy, but to all of us. So, is the Festival still relevant? Indeed it is, and it is important to support it.